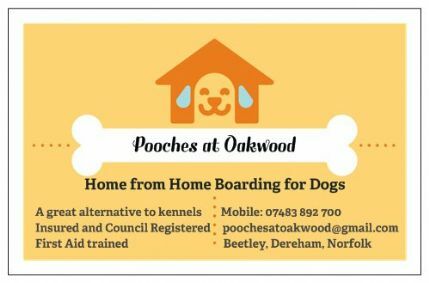 We are both very passionate about caring for all canine friends and so decided to open Pooches at Oakwood as a way of providing a service that we would find useful if we were going away and wanted to leave our dog in the care of someone else. Every dog is special and unique to us and will certainly be treated as such. Before your dog's first stay, we will invite you to visit our home so we can get acquainted with your dog(s) and give you the opportunity to ask us any questions. Your dog(s) will have access to a large secure garden to play or relax in, or - if they prefer - to snuggle up inside on one of our sofas. As they will be treated as part of our family, your dog(s) will be able to use most of the rooms downstairs and will have frequent contact with us. We are licensed to board up to three dogs from the same owner alongside our own Cavalier King Charles Spaniel, Scarlet. By only taking in dog(s) from the same owner at a time, we are able to adapt to your dog(s) needs and dedicate our time to settling them in and getting to know them. In addition to their access to our garden, your dog(s) will be taken for as many walks as is usual for them: staying as close to their normal routine as possible. We have many beautiful walks in our local area and further afield, including numerous dog friendly beaches. We are registered with our local vet and Wendy holds a certificate in Canine First Aid. All dogs must be fully vaccinated (including Kennel Cough) and their certificate must be held on our premises for their entire stay. They must also be up-to-date with flea and worming treatments. Please feel free to email or telephone us for further information. Our girls Marnie & Grace we're very much at home when staying with Peter and Wendy, such a weight was lifted as we had no need to worry about them while we were away. Highly recommend, lovely people, will be using again. Peter and Wendy are fantastic . When they look after your pet it is like home from home . Close attention to detail and show much care . I am very grateful for the excellent care that sparkle received whilst we were away and would certainly recommend Pooches ! Our Yorkie Lola has stayed twice at Pooches and thoroughly enjoyed both visits. Peter and Wendy went to great trouble to find out Lola's routine to ensure she was comfortable and happy in their home. We were delighted with the care and attention that they gave to Lola and will have no hesitation in using Pooches again, and in recommending them. Lola is already looking forward to her next holiday with them. Dennis has stayed at Pooches and his stays were lovely Excellent accommodation can Highly recommend, with 3 walks a day lots of toys and treated like one of the family he loves going and we have complete piece of mind. We knew that our much loved and ,possibly, a little spoiled two year old whippet would be ok when we arrived at Peter and Wendy's house and Lucy was very keen to go in and see her new friends who she had met at a pre stay visit. We were a little concerned about leaving her but were put at ease immediately and made to feel very welcome. We received an email to let us know that she had settled in which was appreciated and when we collected her she was happy and relaxed. Thank you for looking after her so well and we feel relieved to know that we have found somewhere so lovely to leave her next time we are away.